But I guess they already have that. And so do I. The Adamas is a tank of a knife. A buttery smooth tank, but still one nonetheless. So during my initial testing of the Benchmade Bugout, I also packed along the Benchmade Adamas for reference. The Adamas is in a completely different class than the Bugout. As a folder, the Adamas wanders deeply into the territory and performance of a stout fixed blade knife. The Bugout, however, has very little in common with its fixed blade cousins. Things the Bugout does have in common with include air, invisibility, stealth, and svelte. The answer is found in both the philosophy and the engineering of the Benchmade Bugout Axis Folding Knife. First of all, there is absolutely no compromise with the blade. And that is essential given that anything labeled bugout must double team as a last blade as well. Benchmade cut massive weight in the Benchmade Bugout Knife by using internally milled-out scales, and a ⅓ length steel liners. Topping it off is a shortened and hollowed steel pocket clip. Just how non-massive is the Benchmade Bugout Knife? It tips the scales at under two ounces. Only 1.85 ounces according to Benchmade’s website, and according to my digital scale, 1.86 ounces. That difference could easily be pocket lint from my daily carry. Compare that to the 3.88 ounces of the full-sized Benchmade Griptilian or even the 2.8 ounces of the Mini Griptilian. The reason I mention bug out philosophy with the Benchmade Bugout Knife is that I always assumed a bit of pre-planning would be possible when it comes to bugging out. That would afford me and you the time to choose a major knife ready for whatever bug out action the particular scenario calls for. So an ultralight nearly invisible pocket carry blade was not on my menu. At least at first. Having put the Benchmade Bugout Knife through my daily domestic and outdoor chores for a couple months now, I am actually thrilled with the Benchmade Bugout Knife. Seriously. 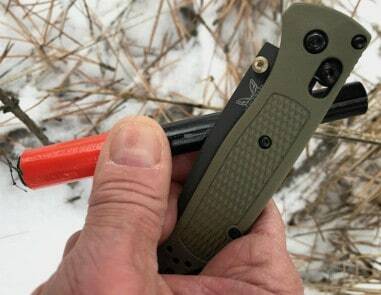 As long as one considers what it takes to make this ultralight bugout knife and exercises a bit of restraint with non-cutting tasks especially prying, chopping and twisting, the Benchmade Bugout Knife will slice and dice well above its weight class. And due to its weight and svelte, the Benchmade Bugout Knife will be with me always. The Benchmade Bugout blade came razor-sharp from the factory. The version I’m working with has a smoked gray, chromium nitride coated S30V blade with a wonderful eve- so-slightly textured feel. The thinness of the Bugout blade works very well with the grind Benchmade chose for the Bugout. It’s a classic drop point blade with flat grind, well slightly more of a high flat grind to be specific, with a mild unsharpened swedge on the tip. Thumb studs grace both sides of the blade, and the obvious Axis Lock lever also offers an opening option by a retraction and wrist flip. Because of the light weight of the blade, there is little mass to put into motion so it might take a few dozen openings to get the Bugout properly seasoned for wrist-flip Axis opening. But when it does, its plenty good. The handles are more handles than scales since scales usually screw onto metal liners, but with minimal liners the scales are the handles. 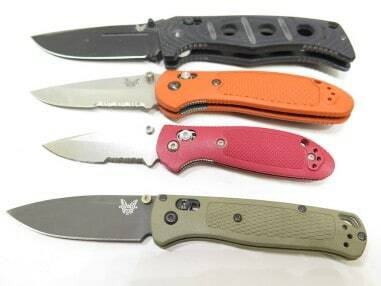 Either way, the Benchmade “Grivory” material is a polyamide thermoplastic synthetic resin in the nylon family. It has great heat tolerance, durability, strength, electrical neutrality, and tremendous chemical resistance. Plus with the right texture, it’s darn grippy. And the Benchmade Bugout Knife has the right texture. Rounding out the aft end of the Benchmade Bugout Knife is a generous lanyard hole. Triangular in shape, it is both functional and weight saving. The knife is just under seven and a half inches open, and just under four and a quarter closed. Due to the light weight and minimalism of the Benchmade Bugout Knife, agressively scratching a firesteel, especially a big one like I carry, is better served by leaving the blade inside its shell. Keep the knife closed and strike the spine of the blade down the length of the firesteel. By keeping the blade closed, any blade-bending lateral force is held within the pocket limits of the scales. The pivot point up front is a solid anchor, and the tip of the knife will push up against the inside edge of the Grivory handle forming a solid scraper. Frankly, the blade-closed striking is a great idea for all folding knives. 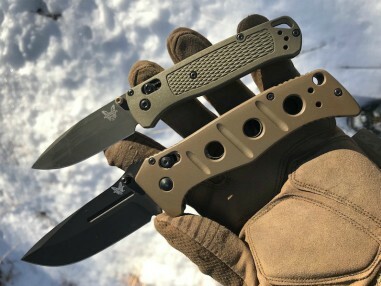 There are two main versions of the Benchmade Bugout Knife, one with a shiny un-coated stainless blade and sky blue scales retailing for $140 (#535), and for $20 more, one with a fully-coated in chromium nitride dark grey blade and Grivory scales colored somewhere between flat dark earth and olive green; a color Benchmade calls “ranger green” (#535GRY-1). Adding a finer blade choice, there is the option for a partially serrated blade in addition to the classic continuous edge. And for those well-heeled but still bugout curious, there a $750 Gold Class version of the Benchmade Bugout Knife (#535-191) complete with “Munin pattern Damasteel and ghost carbon fiber handles are coupled with smoked gray physical vapor deposition (PVD) coated liners…” Not sure if I should drink it, smoke it, or eat it? Needless to say, I won’t be reviewing that particular Bugout Knife anytime soon. Or possibly I will since I did review a Rolex Deepsea watch. Back to reality, the Benchmade Bugout Knife uses the famous Benchmade Axis locking system. A horizontal bar moves back and forth with a thumb stud to allow the blade to either swing freely or lock solidly in the open position. 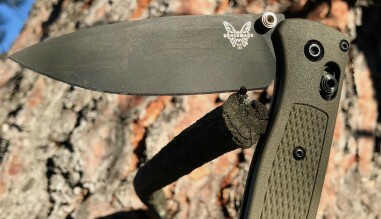 Many Benchmade knives allow blade deployment by simply flicking the wrist with the Axis stud retracted, usually with both thumb and index finger at the same time for grip security. My Benchmade Bugout Knife, however, seems a little stiff to do the wrist-flick-thing. I could loosen up the main pivot bolt, but have chosen not to because the minimal hardware inside the knife is better served by a snug fit than a fast deployment. Further, the 0.09” thickness of the blade (not too thin, certainly not too thick), is fairly low in mass so the flick needs to be precise or aggressive with a clean snapping stop. So as mentioned above, get used to the thumb studs on this one as well. The concept of an actual bugout is one based upon assumptions and predictions. 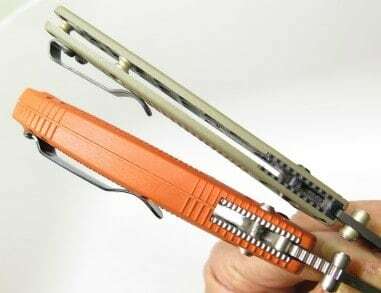 And with the sharp blade being at or next to the most important single bugout tool, essentially the tool that makes the other tools, then the knife must be of sufficient standard to move seamlessly between and across bugout scenarios. A solid build, a fine steel, a flawless edge, and a rock solid reputation for quality simply gets a knife through the door for an interview. From there it is up to the user and his/her skill to make the final decision. So at the risk of a pun, I am confident the Benchmade Bugout Knife will make the cut. So whether or not the Benchmade Bugout Knife is a true bugout knife depends on your interpretation of a bugout knife. 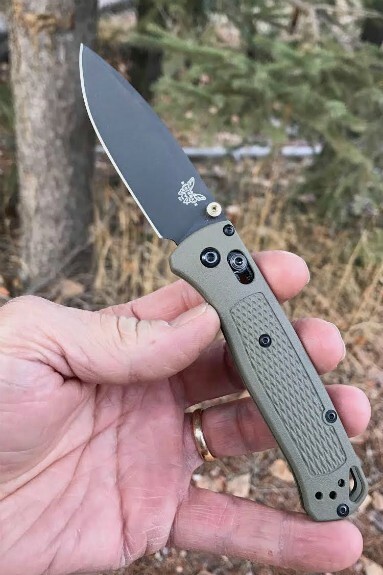 This is Benchmade’s offering, and while I was surprised initially, I now have a complete appreciation for the feature set of this knife, and consider it essential bugout kit…along with some other bigger Benchmades of course. Like the Benchmade Bugout Knife? Click (Benchmade Bugout Knife) & buy from Amazon to support Survival Cache.